LOS ANGELES – For the Warriors, most regular season games exist on a spectrum that generally ranges from underwhelming to enjoyable. Some nights, like the one in which Klay Thompson hit a record 14-3-pointers, or Steph Curry or Kevin Durant’s 50-point nights, exceed that range. Still, there’s a familiarity in those games. We’ve all seen the astounding heights the Warriors are capable of reaching, and regardless of how many times they display that level of pure electricity, it will always remain captivating. There was a unique energy, unlike we’ve ever seen before. It was not about seeing if Curry, Thompson and Durant could each score 30, while Draymond Green quietly put up a 10-by-10 triple-double. There was a new, massive wrinkle being thrown into that mix. 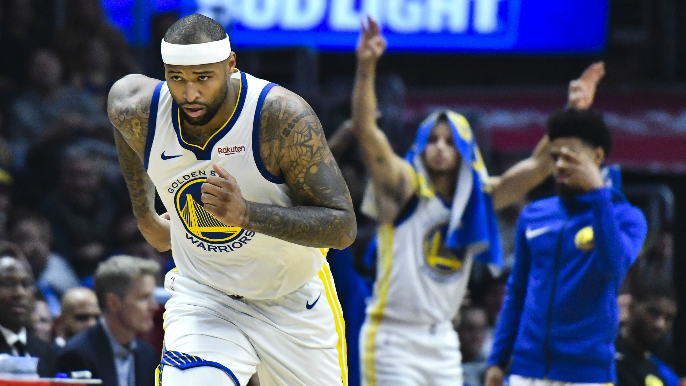 DeMarcus Cousins started in an NBA game for the first time in nearly a year, giving the Warriors arguably the most devastating starting lineup that will ever be seen in the NBA: Curry, Thompson, Durant, Green, Cousins. In the brief, 15-minute glimpse that we saw of Cousins last night, there were some immensely positive signs. Concerns? Sure, Cousins played one game and there will undoubtedly be growing pains and the risk that his traditionally high usage rates and expectations of getting the ball will clash with the Warriors easy-flowing offense. But if Cousins does what he did last night on every single night for the Warriors, it’s hard to see how any team could beat them (which was true even before Cousins debuted) in a playoff series. The lineup below features Cousins, Thompson, Green, Andre Iguodala and Shaun Livingston. Thompson is the only consistent threat from 3-point range, while Iguodala and Green are streaky at best. But in this sequence (and the whole game, for that matter) the Clippers seemed to forget that Cousins is a consistent threat from deep. That threat will ruin the night for any opposing coach who already has to game plan for Curry, Durant and Thompson marauding around the perimeter. Since the 2015-16 season through last year with the New Orleans Pelicans (four years), Cousins has shot 35.2 percent from 3-point range (right around the 35.5 percent league average this season), with an average of 1.6 makes per game. If he’s left alone on the perimeter like he was last night, that percentage is probably going to swing upwards. Cousins fouled out in 15 minutes last night, but his presence on the interior was evident. Even while his defense seemed out of sorts (more on that below), the fact that he was a physically capable body on the interior provides size and athleticism that the Warriors have been desperate for. He is the only true center on the roster (since Damian Jones went down for the season with a torn pectoral), and his presence alone allows an undersized Kevon Looney (6’9″) to not have to take on behemoth centers in the post for 25 minutes a game. Plus, he boxes out opposing centers with ease. His six rebounds, which translate to 12 rebounds on a 30-minute per-game average were more valuable than they might seem in a box score. The Warriors sometimes allow second chance points that should never have a chance simply because there isn’t anyone who consistently out-rebounds other team’s interior players. Now, they do. Even if Cousins plays poor defense on a consistent basis, the physical minutes he’ll provide against opponents’ toughest centers will at least make them work for points, and drain them physically. Without Jones in the lineup, the Warriors have been utterly devoid of that, and it’s been evident, as the Warriors have the eighth-worst defensive field goal percent in the league within five feet (63.4 percent). Back to the fouls: they were clumsy. Defense was where Cousins was, understandably, at his weakest, often getting caught on the wrong foot and committing sloppy fouls that appeared to be a result of poor timing and/or frustration. A lot of that, however, came once the ball was already checked down to the post, and might be more a result of nervousness and excitement rather than being unused to the pace of play. Still, the six fouls in 15 minutes are an undeniable product of playing his first game in a year. Cousins ran up and down the floor like a madman last night. He led a few breaks, was quick in transition, and was generally running hard for a huge chunk of his abbreviated time on the floor. That level of effort is something he’s been called out for in the past, but it’s hard to imagine it will be an issue considering the time of the season he’s starting and the contract situation he faces in the offseason. If Cousins doesn’t prove himself on the Warriors, the long-term deal at near- or full max value he’s looking for might never come. After the game, Cousins said he felt, “probably the fakest love I’ve received in my life.” But that felt like more of a dig at the fans and media, who Cousins has been at the ire of for years, due to perceived attitude problems and more recently, for his decision to join the Warriors. What’s clear is that despite the criticism he’s faced, he’s been embraced by the Warriors roster wholeheartedly. That’s all very cute and heartwarming and what have you. It’s encouraging to see Cousins ingratiate himself to the rest of the Warriors’ stacked roster, and seeing his teammates recognize the journey he went through to get to this point. The biggest question is whether Cousins will remain so well-loved when he really starts feeling himself. When Cousins realizes he can back anyone down in the post again and get his points when he wants, will that instinct to pass start to fade? Will there be a moment in which Steve Kerr chastises or tries to explain to Cousins that there was a pass or a cut for him to make, and Cousins won’t respond well to it? Those are entirely hypothetical questions, and from everything we’ve seen so far, and considering Cousins’ contract expiration at the end of the season, it seems like he’ll be on his best behavior. But, as we saw with Durant and Green earlier this year (a situation which appears mended, at least on the court, but which is surely not forgotten by Durant), it only takes a moment, a second of frustration and anger, to create chaos. Cousins is prone to that, and while it’s been one night of smooth sailing, you have to wonder whether he will continue to coexist with the team so amicably once he’s back to where he once was.